The continuing tale of the establishment of the postal services in Port Elizabeth from its inception in Cape Town until its extension to Uitenhage and by implication to Algoa Bay before 1820. This part deals with the postal service from the appointment of the hamlet’s second Postmaster, George Ubsdell in 1828 until the resignation of the Postmistress, Mrs Biggar, the third Postmaster after William Dunn and George Ubsdell. Dunn’s replacement in January 1828, was an 1820 Settler by the name of George Ubsdell. He had farmed his allotted land in Albany until he was forced to leave and find work in Port Elizabeth. 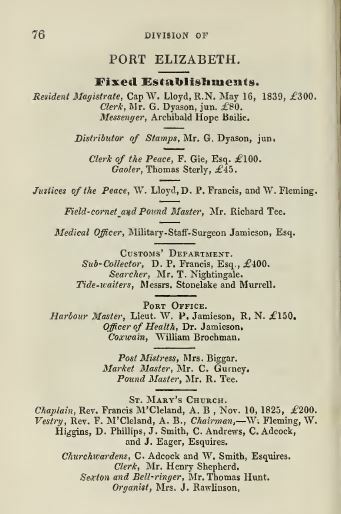 Apart from being Postmaster from 1828 to 1840, as the annual salary of £40 was insufficient to live on, and the quantity of mail sparse, Ubsdell occupied various other positions simultaneously: Port officer, vendue clerk and tide waiter. Interestingly, he was also the oldest Apothecary in the Cape Colony in 1871. In line with the phenomenal increase in the growth of the town, so did the utilisation of the postal services increase. 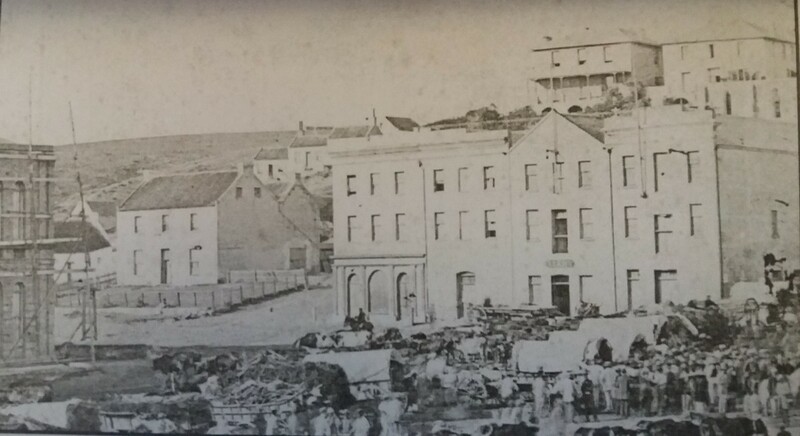 This was also aided by the fact that in 1836 Port Elizabeth became a free warehousing port. From a revenue of £140 4s 0d in 1840, it surged to £531 8s 8d in 1841. By this time, the postal service within the Cape Colony had become fairly regular, rapid and inexpensive. The main post road ran from Cape Town, through Caledon, Swellendam, George, Uitenhage to Grahamstown, the total distance being 1046kms. At the post cart’s normal speed of 9.6kms/hour, it meant that by leaving Cape Town every Friday evening, it would reach Grahamstown on the following Thursday morning. The mail would reach Port Elizabeth on the Wednesday after it had been deposited at the Post Office in Uitenhage. By employing cross posts, [probably now called cross docking], communication by means of letter had become convenient and certain. As the volumes increased, and hence productivity improved, the cost of mail declined. 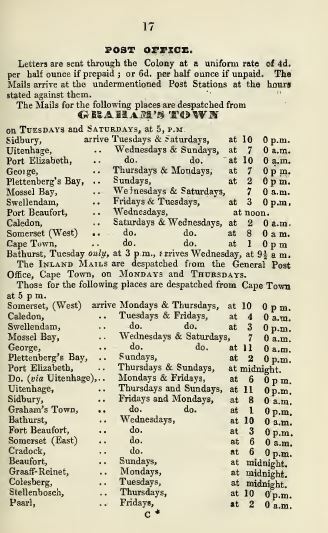 By this time, the cost of a single sheet letter from Cape Town to the service’s terminus in Grahamstown, had now been reduced to one shilling, with the charge for intermediate locations being pro rata the distance travelled. The exception to this rule was periodicals on which a tariff of one penny was applied whatever the distance travelled. Letters directed to Europe or any other foreign destinations were levied at 4p for the ship conveyance portion of the charge. Generally, post reached England within eight to ten weeks with the return of post between Port Elizabeth and England being from between five to six months. That meant that a letter could be despatched from, and its reply received in either location within that period. 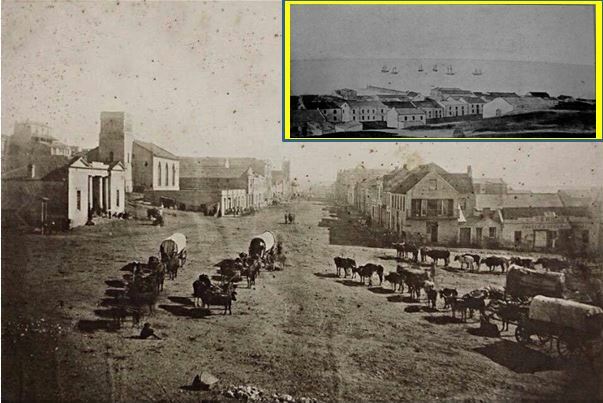 It was in 1840 that a fundamental change would be made to the Postal Service in Port Elizabeth. As the quantity of mail to Port Elizabeth had increased significantly, it was deemed necessary that the Post Office be established in its own building. Furthermore, it was proposed that the time of the Post Master be devoted exclusively to his postal duties. The incumbent would not be allowed to have any sidelines which would interfere with his postal duties as in the past. But whilst the Government exacted full-time duties from its humble postal official, it would not relent on its meagre salary of £40 per annum. No man could be expected to exist on such a paltry salary especially if they were married. Hence, it was with a heavy heart that George Ubsdell would be obliged to resign as Post Master after twelve years in the post. It was only a married female who could subsist on this remuneration. Thus, it was that a female, Mrs. Mary Biggar, would fill the post by commencing her duties on the 17th December 1840. Instead of the multipurpose building – probably more like a shack – that was previously afforded the grandiose title of Post Office Building, the Post Office would now be housed in its own more appropriate and official building. For this purpose a house on the southern, Baakens Street side of the future town hall was acquired. This was a two-storeyed house, located at the foot of Castle Hill, and enclosed by a low fence. It was built in the early Settler style with whitewashed walls and the ubiquitous red-tiled roof flanked by two squat chimneys, whilst at the rear were the usual outhouses and stables. Much like in modern day British hamlets, the rooms downstairs served as the Post Office whilst the upstairs rooms served as the accommodation of the Postmistress and her husband. Flanking it on the right-hand side was the tumble-down jail overseen by the dutiful gaoler, Thomas Sterley. This building had been used in this capacity since the early Settler days. Across the road, on the other corner of Castle Hill road, was the printing firm of Messrs. Richards, Impey & Co. In spite of ever-increasing volumes of mail and hence work, the amiable and industrious Mrs Biggar faithfully discharged her duties as postmistress at the derisory pittance of £40 per annum. No additional assistance was provided to her to recompense her for her efforts nor was any recognition offered to her in her endeavours. “Some ten years ago when I first came to the Colony, I passed a few months in Port Elizabeth which appeared to me on my arrival, I remember, as scarcely more than a village. On revisiting it now, I have been struck with the great improvement visible in every direction………. A few days since, with my mind agreeably occupied with the change that I beheld, I made my way to the Post Office in [my] quest of intelligence from [my] absent friends. My letters were handed to me by the Postmistress, whose mourning garb indicated that she was now a widow. Under the impulse of the moment, and with an apology for a question that from a stranger was, perhaps, not a discreet one. I asked her what had been her increase in salary since she had held the office she filled. I learnt that during the eight years [that] she had been Postmistress, the receipts (notwithstanding the reduction in the amount of postage [cost]) had about doubled, while (besides £12 per annum allowed as rent for an office- little enough where, I hear, rents are high) her salary amounted to only £40 a year, a trifle more than two shillings a day [that] I have been accustomed to pay a Fingo in my garden. And for this miserable stipend, is this lady, it appears, expected to devote all her time and attention to the duties of her office. Ought such things to be? It is very possible that if she gave it up because [she is] underpaid, other might be found whose fortunes are at so low an ebb that they would be ready to undertake the duties [that] she relinquished for the same insufficient payment. But is this the view [that] the liberal government ought to take in such matters? It is interesting to note that my great-great grandfather, the Rev Francis McCleland of 7 Castle Hill, the first clergyman at St Mary’s Church and an 1820 Settler, also experienced a similar problem as the Postmaster. In his case, his salary of £200 per annum remained fixed for the period 1835 until his death in 1853. Unlike the docile, placid Mrs Biggar, my ancestor did not take his salary situation without equanimity. Instead he badgered all manner of officials including the Duke of Wellington, but all to no avail. In that case, what were the chances that a lowly Postmaster, and a female to boot, would achieve any increment. 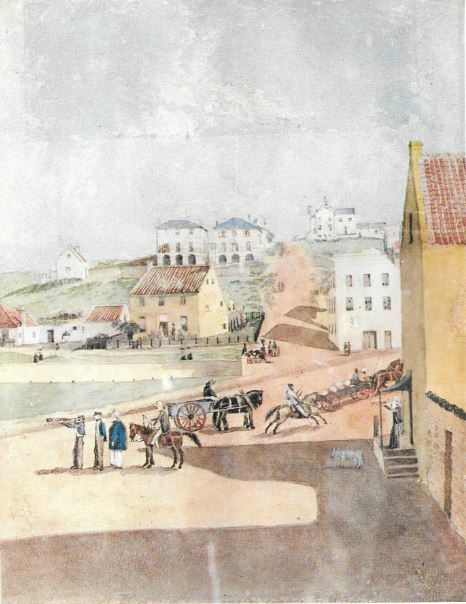 Above: Mary’s Church in the 1850s and Main Street with its double storey buildings comprising a shop on the ground floor and living accommodation on the first floor. In those days, the postal service operated on a counter to counter basis. By that is implied that there were no postmen and that the residents had to call at the Post Office themselves in order to collect their mail. Furthermore, as Port Elizabeth, in spite of its increasing prosperity, was not on the main postal route which bypassed Port Elizabeth by being routed through Uitenhage. Only by the time of Mrs Biggar was this remedied when a mail service was instituted between Cape Town and Port Elizabeth. This came overland by special post cart in a four-foot square box and took about three days, travelling day and night in relays. “The wet state in which the letters have several times of late been received here, from Capetown especially, should induce, we think, the Postmaster-General to adopt some new methods with the post bags by which letters may be more effectually protected from the rains. Instead of using old tattered pieces of torn paper and worn out canvas, he might go to the expense of having proper waterproof cloth covers into which the mail might be effectually sealed or tied [so] that no water could ever reach the letters. 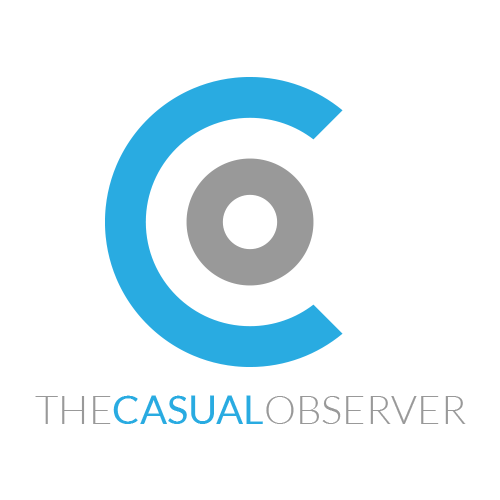 It was not only the state of the mail after its overland journey that drew vociferous complaints; it was also the delays in delivery which raised the ire of residents. It was now becoming a frequent occurrence owing to numerous causes. Whereas when the mail service was first instituted, delays in delivery were accepted as the norm, with a regular “professional” service being implemented, the standards anticipated, nay demanded, by the residents was raised. In one instance, the post from Port Elizabeth to Grahamstown was detained by upwards of fourteen hours. It left the Bay on Friday evening at six o’clock but the following morning the bags were brought in from a short distance outside the town where they had been retrieved from a drunken post boy. This courier in a state of complete intoxication, having fallen from his horse, and had then fallen asleep by the roadside leaving the mail bags in the middle of the track. With brandy and wine being cheap, alcohol abuse was rife amongst the working classes as was evidenced by the number of taverns operating in the seedier parts of town such as Strand Street. Vocal complaints were raised by the residents to the Postmaster-General without satisfaction. By 1851, critics were more open and scathing in their condemnation of the Postmaster-General who was not entirely culpable for the chaotic state of the mail. “It is reported, a short time since in the public papers, that the Postmaster General is about to retire from his post. If he feels his strength insufficient to enable him to work his department, we opine [that] it may force itself upon him as a duty at once to withdraw. We trust that it is not his disposition to excite expectations, however, which he means not or may not have it in his power to fulfil. Not two months ago, he held out to the Bayonians the hope of local letter-carriers. The annexed reply to a memorial on that subject will show how far he has redeemed his partial pledge. Being 70 years old at the time, Mrs. Mary Biggar left the employ of the Post Office on the 31st August 1852 having been the third occupant of this office.